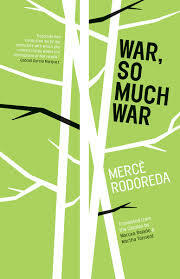 Mercè Rodoreda’s War, So Much War (translated by Maruxa Relaño and Martha Tennent, review copy courtesy of Open Letter Books) is a short novel following the travels of Adrià Guinart, a Catalan youth who, desperate to escape his stifling world, leaves home at the age of fifteen to offer his services as a soldier. In truth, though, the war plays a minor role in the boy’s experiences, at least directly. Adrià roams far and wide, meeting people everywhere he goes, and Rodoreda’s novel is more concerned with the stories he hears, the farmsteads where he finds a bed for the night, and his brief encounters with the local people. However, this is a region where the conflict has left its mark, and with so much war in the air, it’s rarely just the soldiers who are affected. Rodoreda has created a wonderful picaresque novel, a tale of a boy on a journey, which is never about the destination, but about the road Adrià takes. The three parts of the novel reflect the different stages of his journey. The first half is spent running away, confused, fast-paced, with the boy constantly falling, the pace dizzying, disconcerting. The middle section is a chance to breathe out, giving the young wanderer time to look around, before the final part sees his thoughts turn towards home as he finally begins to understand the true horrors of war. He stopped in front of me, stood there for a while, and then asked me if I knew the name of the nearest village. It occurred to me that he was in a jesting mood, but what he really wanted, like most people, was someone to talk to. Someone to lend him an ear. In a country where so many have died, there is always someone wanting him to keep them company, offering him food, shelter or even an inheritance, needing him to replace a son or a husband. Occasionally, he stays for a while, but eventually he always moves on. Perhaps the most important of these lessons is learning that war is one thing, but home is another, one far more important than he’d ever realised. These occasional visions force us to witness the after-effects of the carnage that is happening off-camera. This feeling of disorientation is further underpinned by the language Rodoreda uses. Where the first part uses short sentences that drive Adrià on relentlessly, the second half of the book is far calmer, with longer sentences and more-detailed encounters allowing the boy to find his feet, and catch his breath. Relaño and Tennent have done an excellent job here in reflecting the different pace of the sections and in helping the reader suspend their belief. One reason I wanted to read War, So Much War was because I had enjoyed previous work by the pair (for example, Imma Monsó’s A Man of his Word, published by Hispabooks), and I certainly wasn’t disappointed by their work here (for more about the translators, take a look at this interview over at LitHub). Yes, there is war (and, unfortunately, so much of it), but if we continue to hope, there may be something better just around the corner. Other Mercè Rodoreda books from Open Letter are Death in Spring and The Selected Stories, both translated by Martha Tennent.